Christopher Healy: Chronicler of Heroic Shenanigans | Learn About Me! Christopher Healy is not Iron Man. Christopher Healy was born in the quaint Northeastern town of New York City. It was there, while still an infant, that Christopher chewed the pages of his very first book. Later, he learned that the squiggles on those bound-together pieces of paper had meaning. And thus, a lifelong reader was born. Even in his youth, Christopher knew he would someday be a writer. And he wrote numerous Tables of Contents to prove it, a few of which sounded like they might have been pretty great books had he ever written the stories to go along with them. It would be quite some time before Christopher actually got the chance to write for a living. And his career took many detours in between: cashier, actor, toy store shelf-stocker, person who types things from one place into another place, haunted house zombie, person who checks the spelling of celebrities’ names, etc. Eventually, he cobbled together a tiny little video game review — and it actually got published. Thus, a writer was born. From there, Christopher penned articles for numerous magazines, newspapers, and websites — stories about everything from new video gaming gadgets to the costumes worn by characters in video games (okay, there wasn’t that much breadth back in the early days). Then his own children were born — and Christopher began writing about them. He wrote about their behavior, their taste in room décor, the books they read, the movies they watched, and more. He did so in the pages of Cookie magazine for years, as well as online at ParentDish. He even wrote a whole book about being a new dad (titled Pop Culture — get it, Pop Culture). But finally, he decided he wanted to write a something for his children. And The Hero’s Guide to Saving Your Kingdom was born. That book was greeted with much fanfare and thus, two sequels were born: The Hero’s Guide to Storming the Castle and The Hero’s Guide to Being an Outlaw. Now, he just can’t stop writing. A Dastardly Plot, the first book of a whole new trilogy — A Perilous Journey of Danger & Mayhem) — has just been born. And its two sequels will be born sometime in the near future. His first picture book, This Is Not That Kind of Book, will be born next year. And of course, he still writes about all sorts of other things, as well. Including himself. And thus, this About Me page was born. 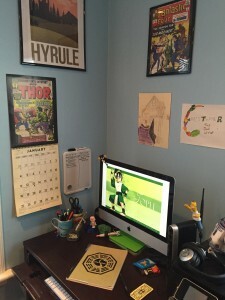 This is what his desk looks like. Hi Anusha! I’m so glad you like Hero’s Guide. Here are a few quick writing tips (maybe some will help). 1. Always revise! Your work will never be as good as it can be on the very first try. The more you rewrite the better it will be. 2. Read your work aloud. Sometime a sentence can look good on the page, but when you read it aloud, you realize it sounds awkward and needs some fixing. 3. Read a lot! The more you read, the better a writer you will be. Expose yourself to as many different voices and styles as possible; maybe one will inspire you to try something new with your own work. Good luck! Thanks! I have finished writing the third book, but there’s still a lot of work to be done in producing it. It will be out next spring. The second book is already out! The Hero’s Guide to Storming the Castle — check it out! And the third book in the trilogy, The Hero’s Guide to Being an Outlaw comes out next spring. Thanks for reading! The Hero’s Guide has easily become one of my very favorite childrens’ novels. I like that I’m able to identify with each of the characters (even the villains) in ways that makes the story more interesting and three-dimensional. One of my favorite aspects is Gustav and Frederic’s friendship, which can be both funny and heartwarming- I really hope I get to see them interact in future books. The idea that heroes can come in different shapes and sizes really made me smile. If you ever get a chance to read this, would you mind telling me when you plan to release the next book? Also, do you plan on writing any other books (for this age group or otherwise)? Thank you for writing these books! Thanks so much for your kind words! The friendship between Frederic and Gustav is one of my favorite aspects of the series as well. 🙂 The second book, The Hero’s Guide to Storming the Castle is out now. And the third will hit stores next spring. I hope you enjoy the rest of the trilogy as much as you did the first part! How did you come up with DeeB Rauber,the bandit king? I asked my son, “If you could be a character in a book, what kind of character would you be?” And he smiled deviously and replied, “A bad guy!” I’d always wanted to write a story in which adult heroes were pitted against a child villain, so I decided to go for it. My name is Mitteo. I am in 3rd Grade. I love your books. I am reading the 2nd one now. One of my homework is to write a postcard to my favorite author. I need an address to put but cannot find one in your webpage. Please send me an address. Hi, Mitteo! You are absolutely right! I did not have any address listed on this website. Thank you for pointing that out. Because I just fixed it, and now I do. Click over to the “Write to Me” page to find the address. I look forward to your postcard! I read the first two books in the Hero’s Guide series, and I CAN NOT WAIT for the next one! Duncan reminded me SO MUCH of a friend of mine (yes, a guy, but no relationship), who is different as well. We sort of became friends because no one talked to him, and like Snow, I think like he does. And if you ask some people, I’m a bit wacky too. 🙂 Gustav I also REALLY REALLY liked, because he reminds me of a favorite character in a story (hopefully someday book) that I’m writing. His name is Engilram, he’s seven feet tall, he can’t stand other human’s stupidness (like he’s a genius! — sarcasm), and he is strong enough to do some of the things that Gustav can do, possibly more. Although he’s not so battle-prone. He actually wants to mind his own business hidden away in his little hole (well, not so little) in the forest. Of course, I can’t leave out the other people. Liam is just plain COOL, although a bit full of himself, Frederic is so hilariously hopeless, and Ella is so sweet! My favorite, however, has to be Deeb Rauber, who is a reminder of my own little brother, although J.C. isn’t quite so bad. Okay, okay, I’m rambling. Gustav is my favorite, plus I like the nicknames that he gives to the other ones. Mini-cape, etc. And I like the trolls. 🙂 After I read #3 I might want #4! Hi, Grace! Thanks for writing! I’m glad you like my stories, but yours sounds pretty cool, too. I think Engilram and Gustav would get along quite well. Or… On second thought, they may drive each other crazy. Which would be far more entertaining. 🙂 Keep reading and keep writing! Gosh I commented this ages ago! 🙂 I have a lowly little writing blog that I share with a friend of mine at 12shortstories.blogspot.com, and I attempt to write about writing although I probably don’t to the best job. I’m mostly telling you this because I just wrote a thing about children’s books and mentioned yours. (Also Engilram has developed into a 21st century LOTR nerd, history geek, and grammar correcter. He’d probably write about Gustav more than get along with him). Hello I just read your first and second book. They were great! I can’t wait to read your 3rd book. I am in 4th grade and trying to make a book too. Do you have any tips? Tips for making a book, eh? If it’s more than 10 pages, don’t try using staples–they’ll never make it through all the papers. Sorry, that was a terrible joke. But seriously, my biggest tip to new writers is to revise, revise, revise. No matter how cool and interesting your story is when you’re done with the first draft, it can always be better. Think about it in terms of baking–you can make a super delicious cake, but wouldn’t it be better with rich, creamy frosting on top? The revision is the frosting. If the Heroes Guide was a cake, it would be a rich, delicious chocolate cake. With a fork, Mmm, fudgey. Is Avondell the richest of the 13 Kingdoms? I just finished your third book today (June 13, 2014), and am sad it’s the last. But it was still a great trilogy and thank you for making it so great, especially the (probably shouldn’t read this if you’re yet to get the Outlaw Book) love connection between [SPOILER]. You’ve inspired me to write my own fairy tale book! It stars Snow White, Cinderella, Rapunzel, and Goldilocks! Sorry I had to block out a little part of your comment, Bryan, but I wanted to hide a little bit of spoilery info for anybody who hasn’t read all the books yet. I love your predictions about the various love connections in the story. Very interesting. Especially the bit about Briar and the Beast. 🙂 And congrats on writing your own fractured fairy tale! That’s awesome! Well,Duncan and Snow are a given. I made the connection between Briar and the Beast,too! Hii! Thank you so much for writing the Hero’s Guide! I do really enjoy reading it, it’s so much fun! I read somewhere that there’s going to be a movie (?) – if that is true, please, don’t let them change the caracters looks! The thing that there are drawings of scenes makes the books even more enchanted, you know? Again, thank you very very very much for writing this awesome trilogy! Can’t wait for the last book! Thanks! Honestly, I won’t have much say over what the characters would look like in the movie, but Todd’s designs are so amazing, I’m sure they will serve as inspiration for the animators. Well, that’s awesome! It’s so good there’s going to be a movie! My entire family has enjoyed the Hero’s Guide series. Thank you for writing them. We love how funny the books are, the wonderful dialogue and the characters who have all become such friends to us we don’t want their adventures to end! We happen to love fairy tale reboots, and your series is one of the best we’ve read. No kidding, all three books are great. We don’t see that a lot. (I’m gushing, I’m sorry.) I know you have other stories to tell, but I hope this is not the last we will hear from the Heroes. Val JeanVal was such a great addition and she only got to be in the last book! I also clicked around your website and played the trailers. They reminded me of something out of Monty Python. So fun! Hello Mr. Healy I have a friend named Aidan Healy and I was wondering if he is somehow related to you? I believe he may be my 14th cousin, twice removed. Although I’m not even sure what that means. So, no, not related. Sorry. Thank you. Personally, I hope someone else makes a movie out of it, because if I make the movie, it will just be a bunch of poorly animated stick figures. Thankfully, Fox Animation and Blue Sky Studios are on the job. First off, thank you so much for writing these book! I’ve read all the Hero’s guide books and they’re absolutely amazing and hysterically funny!! I couldn’t stop laughing when I read them. My best friend got your first book and liked it so much that she called me up on the phone and read me Duncan’s entire intro scene. After that, I grabbed all three books from the library and completely enjoyed them! Even my big brother stole and read them too and he doesn’t usually like kids books. I also loaned it to two girls I babysit and they love it too now. I absolutely love your characters! Characters are always my favorite part in any story and quirky ones are always the Best! Each of your characters is so different and fun. I could go on for several paragraphs about what I like about your awesome characters but that would just be annoying if I did. So I’ll just say that my best friend and I are both writing our own books and several of your characters remind us of some of ours (I’ll refrain from copious details) which makes me love and connect all the better with yours. I think it was genius how you made your characters so different from in the original fairy tales and their Disney rendition and some of them didn’t even end up with the same people as they did in the stories. How did you come up with such different personalities and plots for the main characters? Thanks so much for you kind words! It was very important to me to make my characters very different from previously existing versions, so to build them, I started with some of the original classic fairy tale versions (from which we are given the least information about the characters) and started asking questions. Anything that didn’t make sense or that seemed like a gaping plot hole (Why didn’t Rapunzel’s prince ever get a ladder? If Snow White’s prince was royalty, why was he wandering in the woods all alone? And so on…). My answers to these questions gave me the details I needed to flesh out my characters. Well, I am very happy for that 3rd grade whim of yours! Thanks for being such a great fan and for spreading the word about Hero’s Guide! Keep at it and you’ll be my hero. if you ever write a fourth Hero’s guide book, I’ve got a lot of chapter titles for you! if you ever write a sequel. you can use some of those if you want! Those are really funny, Ben! Thanks so much for your note, Lilly! I’m sure you’d make a great Lila, but unfortunately, casting for the movie would not be up to me. (And if it was, I’d probably have to give the part to my own 13-year-old daughter or she’d never forgive me.) I can’t tell you how much it means to me to hear you say that my books give you a place to go when you’re feeling stressed. That is exactly what my favorite books did for me when I was younger, so knowing that I can provide that same sort of feeling to other kids makes me feel really good about my choice of profession. I will indeed be writing more books–check out The Worst Thing About Saving the World on this very website. I hope you’ll enjoy that one too! Thanks again! As they say in my country, that is so cool. I have read and loved two out of the three Hero’s Guide books. I plan on reading the third as soon as I can get my hands on it! Thank you for writing, and I hope your newest book becomes another success. Whew! Until I read your second sentence, I thought you were saying that you read all three but only liked two. I am so relieved. For now, anyway. I hope you enjoy the third! i was just looking at your photo and i noticed you look a bit like Bail organa from revenge of the sith. Have you seen star wars? But, yes, I’ve seen Star Wars. About a gazillion times. I wish Chewbacca were my best friend. So, Ben, I’m curious… If you had to match up Hero’s Guide characters with their most similar Star Wars characters, whom would you match with whom? Seriously? I LOVE Lord of the Rings. I read it in fifth grade. No one told me that it was to advanced for me, though. I read King Arthur after that, and now I still talk medieval sometimes. I think that Liam= Aragorn, Lila or Ella could = Eowyn, Snow or Rapunzel could = Arwen, Frederick could = Sam (maybe), Duncan could = Pippin, Ruffian (maybe) could = Gandalf, Periwinkle Pete = Legolas, and Gustav could maybe = Gimli. I don’t know. Lord of the Rings characters are hard to compare to other characters, no matter how good they are. And did your teacher really punish you for spelling the plural of dwarf “dwarves”? Seriously? Well, do you think that my matches are any good? I mean, do you think that the characters that I said were alike really are alike? Absolutely! Especially the Ella/Eowyn comparison. That’s pretty much on the nose. Briar rose = Mmm…still working on that one. any idea? mm. i guess you’re right. the reason i was thinking Jabba/Deeb was because they both like to be entertained and pampered while rundark seems like a tougher more brutish guy. Hi Mr. H! My name is Erin. I am currently reading “A Hero’s Guide to Being an Outlaw”, and I am, as they say in my country, LOVING IT! I love the girl-power you give to characters like Ella and Lila and Captain Jerica. I am about halfway through the third book, and can’t bring myself to put it down! Things like, “What will happen next? Will [SPOILER] make it off the island? Will Rundark succeed with his plan to take over the thirteen kingdoms?” keep popping into my head. Each character has their own personality, and that is one of the many things I love about your books. I think it would be pretty cool if you wrote out and published Duncan’s book, “A Hero’s Guide to Being a Hero”. Sure, there are little excerpts from it in the second book, but I would love to read the full version. I do know that once I am done with the series, I will be super sad. I have to say that this may be one of the greatest book series I have ever read, and being a HUGE book lover, that is high praise. Now, I better go before Lord Rundark throws me into the moat of bladejaw eels like he did to Redshirt in book two. Well, as they say in my country, ta ta! Hi Erin! As they say in my country, THANK YOU! I’m so happy to have you as a fan. It may be a long time before we see any more Hero’s Guide books, but I’m planning to do some exciting HG-related things right here on my website, so please stay tuned. is the official Hero’s guide website going to be updated to include stuff from the next two books? That would be a really good idea, wouldn’t it? I’d better look into making that happen. If you’ve got a general story idea and maybe ideas for some scenes, start by writing out those scenes. Not completely, just in outline format. Put them on index cards or post-its (or origami swans if you want to be really crafty) and arrange them in chronological order. Now you need to fill in the gaps. Figure out what has to happen in between those scenes. It’s like putting together a puzzle. That’s just one possible way to get started, but it’s a pretty fun one if you want to give it a try. I’m also trying to write a story, and I finished it already, but it has some boring chapters, and is only 50 pages. And I don’t know how to copyright anything, or self-publish anything. As they say in my country (and the LEGO Movie), Darn, darn, darny DARN!!! If you’re bold enough to attempt it, there’s a magical process you can use to transform those boring chapters in action-packed scenes of thrilling drama and excitement. It’s called “Revision.” I don’t think they taught that at Hogwarts, but maybe they should. Well, they don’t even teach math at Hogwarts. I doubt they teach the fine art of creative writing. My book dedication: This book is for… wait, does it really have to be dedicated to someone? It does? Then, it is for everyone from my 6th grade class (you know who you are). And all my favorite authors. J.K. Rowling, J.R.R. Tolkien, C.S. Lewis, M.P. Haddix, and even people who don’t have initials for names, Like Christopher Healy. Mr. H., you are last because, you are the one person with an actual first name. Anyway, ever heard the saying “best for last”? Thank you. I am truly, honestly, and most sincerely touched. Hello, Mr. Healy. I am back. It has been 2 years. I never did finish that book- it went kind of off the rails, and I somehow managed to lose my draft (I think I saved over it). I now write (bad) poetry and (equally bad) short (usually horror) stories. After all this time, I still love your books, though, and while I don’t know why I was going to dedicate that book to my sixth grade class(they were horrible), I would still dedicate all my (stupid) poetry and stories to you and all my other favorite authors. And, I have to say, what about your annoying cat? What is so annoying about him/her? Ugh. I have a cat, too. He is old and boring. Not so bad, considering that I own glasses. I have recently learned that it was not just my cat who liked to knock glasses off counters. Apparently this is something many cats enjoy. It’s a cat sport, so to speak. That’s fine. I just don’t want my house to be the playing field for it. Glasses?As in cups or those-things-you’re-always-forgetting-are-on-your-head? I’m sure she would have attacked either, but it was mostly the drinking glasses that shattered and made big messes. I work on a rather heavy, 22-inch, wired desktop computer, so if I left it someplace, my first question would be, why did I bring it someplace? You are awesome! And so are your books!! I hope you make another book about the league of princes! ^.^ um, no offense but you kinda look like robert downey… lol anyway my fave character is Duncan, Snow, Ella and Lila! And my fave scene is anything with Duncan and Snow in it! I might talk more tomorrow. And I have a question, Is there going to be a movie? Because there should be! You’re not the first person to compare me to Iron Man. Check out my new author photo above. I saw that you were an actor… Did you play anyone? If so, who? An epic and tasking role that will be remembered and honored well past our dying days,I’m sure. *insert sarcasm emoji,since I don’t have any. Hey, I influenced a lot of people with that role. Or at least I assume so every time I see someone eating corn. Thus far, I’ve audio-listened to only the Hero series (books 1 and 2, via public library*), but I must say: as superb is your writing, Bronson Pinchot is the flourish to your dots. Please do have him perform them all! I intend to start a campaign to have him retroactively awarded a Grammy for these gems. Mr. Pinchot did indeed record all three Hero’s Guide books! And he won a much-deserved 2014 Audie Award for his performance of The Hero’s Guide to Being an Outlaw! I’ve absolutely LOVED all the Hero’s Guide books. As soon as I get money, I check Barnes and Noble to see if the next one’s out yet. The third book is leaving me in so much suspense!! I also enjoy writing so much. My friends say the most annoying thing about me is my inability to stop writing. I read them the novels I write all the time. Usually I’m pretty shy about this stuff, but as soon as your first book showed up in my school library, I hogged it for most of the year, thinking it’d be special. I just have one question, though; If I someday wanted to let the world see those stories, what advice would you give me to start that? Good luck with your writing! Writers are awesome people. It sounds like you’re already building an audience for your writing among your friends. But if you want a chance for even more people to hear your stories, a quick and easy way to do that is to start a blog and post your stories on it. And if you decided to try to get a real book published someday, you’ll have those blog stories to point to as examples of your writing. Thanks! It’s really exciting to talk to you. Thanks so much for the advice!! So, I’ve been readingWildwood to my sister and mom. One of the characters is ‘the Bandit King’ and I crack up everytime at how he’s good at his title and he’s my favoritecharacter, comparing him to Deeb Rauberwho’s terrible as the Bandit King, but he’s totally my favoritecharacter next to Lila and Gustav. Whichmember ofthe LeagueofPrinces do you most relate to? A Bandit King character appears in lots of old folklore and fairy tales, which is why such characters appear frequently in books based upon folklore. But let’s be honest–no Bandit King is quite as cool as Deeb Rauber. You’re in luck! Because the second book is already here! And so is the third. And there may be a fourth in the making. p.s. Sorry if you answered this already, I kind of just went down to the bottom and skipped over the rest of the comments. Except for maybe the first one. Thanks! I certainly hoped the books would get better as they went along. Perhaps the fourth book will be the best of all–whenever I get around to writing it, that is. I’m currently working on two other books, neither of which is connected to the Hero’s Guide series. But I will eventually return to the Thirteen Kingdoms! Please, there’s no need for name-calling. I think our friend Annabeth was referring to the exclamation of joy, rather than calling you a name. How is that an exclamation of Joy? I’ve seen “Inside Out” and I don’t think Joy yelled, “Wahoo!” anywhere in that film. You know what we mean. *facepalms in frustration*. anyway, even if Joy didn’t, I bet Bing Bong did. 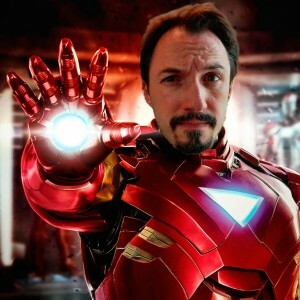 I don’t know… You’d be a pretty good Iron Man. I’d get claustrophobic in the armor. That’s too bad. You know, I’ve heard that they’re actually coming up with exoskeleton-body-armor-things. I’m sorry I won’t be able to come to the April is for Authors celebrations. But I’m so happy that you like my books. If your teacher would be interested in having me talk with your class through Skype, though, I’m sure we can arrange it. Just have your teacher contact me. Your book was an enjoyable read… My 10 year old had been urging me to read this book for almost six months. I finally ran out of excuses and picked up the book (not to mention, quite reluctantly). I had no idea what a pleasant surprise I was in for….. I am glad that my son was persistent and made me read your book. Oh!! Almost forgot!! WE NEED A MOVIE!!! please! it would be awesome to have a movie of these books!! How do we promote this!!!??? An animated film is in development from Fox Animation/Blue Sky Studios. Keep posted for updates! Clean the comments field? I can do that? Anyway, I’m a longtime Marvel fan myself, so, I take your comment as huge compliment. Keep working on your dad! Tell him I said all good parents take their children’s reading recommendations seriously. Oh alright I will tell him that ; ) OH YAY!! Can’t wait for it to come out! Yes! I love Marvel too! I have only been a Marvel fan for about 3 years but some people might call that long term… I’m not sure what other people think about that 🙂 Me and my sister are working on a book but I hate writing and she loves it so she will be doing the writing and I will be doing the drawing (which I think i’m pretty good if I do say so myself.) I am also quite good at acting, any tips on getting into the acting career? My acting advice? Read a lot of books. It’s the best practice in the world for getting into the minds of different types of characters. Hi, my name is Kieran and I was wondering if Christopher Healer will be writing another book in the hero’s guide series because I hae been checking for word on a new one for what seems like forever now and I haven’t come across any news of a new one. I can’t stand waiting any longer due to the cliff hanger the final book has left me on. There’s a new Hero’s Guide short story coming out this year, but you’ll have to wait a little longer for another full Hero’s Guide novel. My brother and sis-in-law got my 11 year old niece the Hero’s Guide trilogy for Christmas. I’ve never seen her that excited about a gift. She’s already read them all, but to actually own them herself was beyond fantastic. Needless to say she sat me down and showed me all the drawings in the first book and explained who everyone was. “Mo, you have to read this book!” I cannot tell you how happy I am that I get book recommendations from her. Makes my bookworm heart happy. Just finished the first book and I can’t wait to discuss it with her! Duncan is my favorite. Thanks for creating this special moment for us and many others out there! Thank you so much for sharing that with me. Makes my bookworm heart happy as well! do you like harry potter, star wars, or lord of the rings ? and how many kids do you have? what is it like where you work? how long have you been a writer? did you ever have any other jobs? how old are you? how many books have you read? do you like cats? have you seen the series of unfortunate events on Netflix? have you read the book series for it? did you know that Lemony Snicket put a story in the same anthology that you wrote about on your site? do you have any brothers or sisters? do you play any instruments? how many times a day do you get in your site? 1. Do you like harry potter, star wars, or lord of the rings? Do I have to choose just one? 2. How many kids do you have? Two. 3. What is it like where you work? Blue, with lots of toys and pictures of superheroes. 4. How long have you been a writer? Unofficially, since I was 7. Professionally, since around 2004. 5. Did you ever have any other jobs? Yes, including cashier, shelf stocker, traveling actor, and haunted house zombie. 6. How old are you? Old enough to have seen the original Star Wars the day it came out. 7. How many books have you read? Just today or over all time? 8. Do you like cats? Cats are cool. 9. Have you seen the series of unfortunate events on Netflix? Not yet, but it’s on my watch list. 10. Have you read the book series for it? Most of them. 11. Did you know that Lemony Snicket put a story in the same anthology that you wrote about on your site? Yes! And I am honored to be in the same book. 12. Do you have any brothers or sisters? Yes. 13. Do you play any instruments? Guitar and piano, but neither very well. 14. How many times a day do you get in your site? Not nearly often enough. have you seen star wars the clone wars on Netflix? I’ve seen the first couple of seasons, but not the entire series yet. It’s quite good! when is your birthday I need to know!!!!!!!!!!!!!!!!!!!!!!!!!!!!!!!!!!!!!!!!!!!!!!!!!!!!!!!!!!!!!!!!!!!!!!!!!!!!!!!!!!!!!!!!!!!!!!!!!!!!!!!!!! and this is a REALLY random question but have you seen the cartoon network series teen titans go if you haven’t you must!